What happens when you go off the beaten track? Rather than the ability to perform outlandish jumps and tricks, Baja has a punishing physics and handling model; your speed can be reduced to a crawl if you forget to slip the clutch on a tight corner, while misjudging a turn can’t be corrected with a power slide. Sadly, there’s so little feedback from the car or the controls that judging the weight of the vehicle on different surfaces is difficult; something that severely hinders your ability to adjust to the unnatural feeling of driving up a ruddy great mountain without a road. We like working our way up through the ranks from battered Bug to elite Trophy Trucks by modifying and tuning our vehicle. We also like undertaking grueling hill-climbs, circuit and rally races in a sim rather than arcade style. But the lacklustre visuals and awkward handling ensure that Baja will probably be consigned to the corners of our minds. 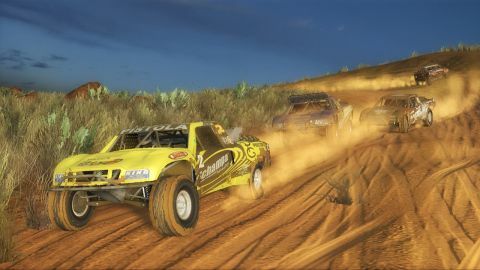 The rare off-road racer with strict sim elements, Baja manages to miss the title of the off-road Gran Turismo thanks to lackluster graphics and horribly awkward handling.